The macabre, satirical film is generally considered one of the greatest horror films of all time - a spectacular, bizarre, high-camp, excessive, humorous, farcical and surrealistic film. Both Frankenstein films were produced by Carl Laemmle, Jr. (the head of Universal) and directed by horror master James Whale, at a time when monster films were diminishing. The film reunited Colin Clive (as Dr. Frankenstein) with Boris Karloff as the Monster, but brought two new characters to the forefront: Ernest Thesiger as a necromancer who has miniaturized and imprisoned various human beings in glass jars, and Elsa Lanchester as the Monster's Bride. Whale anticipated all current and future horror parodies with his effective, insurmountable, over-the-top swan song to the genre. The next two films in the series were Universal's second sequel to the original 1931 film - director Rowland V. Lee's Son of Frankenstein (1939), featuring Karloff's third and final appearance as The Monster in a feature film. This was followed by the all-star The House of Frankenstein (1944), with Boris Karloff in the role of the evil scientist Dr. Niemann. 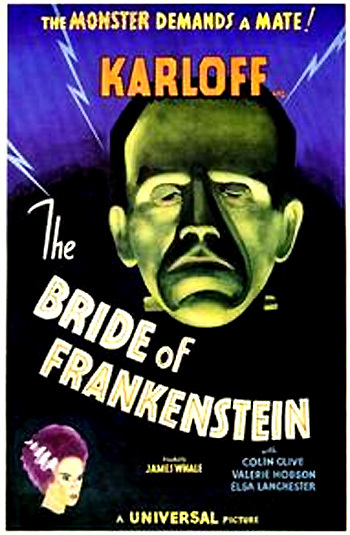 The Bride of Frankenstein was remade with rock singer Sting as Dr. Frankenstein, Clancy Brown as the Frankenstein Monster, and Jennifer Beals as the second recreated Bride-Monster in The Bride (1985). Many years later, one of director Mel Brooks' best satires, Young Frankenstein (1974) honored Whale's original film by parodying some of the scenes and set of The Bride of Frankenstein. With cinematographer John Mescall, Whale expertly created a haunting mood in the film, bringing the influence of German Expressionism into its stylistic imagery and sets and into the performance of the Monster's Bride (Elsa Lanchester) with her jerky robotic movements. He also humanized the Monster by educating and civilizing him, extending his range of expressions and speaking of words, and making him more self-aware. The impressive musical score was composed by Franz Waxman. As in the original film, the screenplay (by John L. Balderston and William Hurlbut) was adapted from Mary Wollstonecraft Shelley's 1816 novel. In the opening (and closing) credits, 'The Monster's Mate' is identified with only a question mark, although Elsa Lanchester is credited for playing Mary Shelley in the film's prologue. [Her dual role as the creator/author of the tale and as the created creature, the Monster Bride, is symbolic of how evil, monstrous forces lie within all of us.] The Monster himself, the biggest star of Universal Studios in the mid-30s, is billed above the film's title with his surname only in bold letters: KARLOFF. This was Karloff's second performance as the creature. Mary: (giggling) Ha, ha, ha. What a setting in that churchyard to begin with. The sobbing women, the first plod of earth on the coffin. That was a pretty chill. Frankenstein and the dwarf stealing the body out of its new-made grave, cutting the hanged man down from the gallows where he swung creaking in the wind. The cunning of Frankenstein in his mountain laboratory, picking dead men apart and building up a human Monster, so fearful - so horrible that only a half-crazed brain could have devised. And then the murder! The little child drowned. Henry Frankenstein himself thrown from the top of the burning mill by the very Monster he had created. And it was these fragile white fingers that penned the nightmare. Mary weaves her new tale of horror, providing a lead-in to the visualization of the film's story. The camera pulls back from the trio and dissolves into the sequel: "Well then, imagine yourselves standing by the wreckage of the mill. The fire is dying down. Soon, the bare skeleton of the building will be dissolved. The gaunt rafters against the sky." The mill burns to the ground while peasants from the village cheer and endorse its destruction. Minnie (Una O'Connor), Dr. Frankenstein's high-strung, screeching housekeeper/chambermaid, exults: "I'm glad to see the Monster roasted to death before my very eyes." To restore order, the village's burgomaster (E. E. Clive) declares the Monster dead and encouragingly sends the mob home. Believed to be mortally wounded after being thrown from the burning mill (his fall only partially cushioned by one of the mill blades), Dr. Henry Frankenstein (Colin Clive) lies on a stretcher. [In the original Frankenstein film, Henry is recovering from the ordeal and getting ready for marriage when the film ends.] Fed up with Minnie's noisy contentiousness about everything, the burgomaster finally tells her: "Oh, shut up!" Hans (Reginald Barlow), the peasant father of the little girl the monster accidentally drowned, and his wife (Mary Gordon) linger at the site. [With bizarre irony, these two villagers are the first to be killed by the Monster.] Unsatisfied and vengeful, Hans is determined to view the Monster's remains: "I want to see with my own eyes...If I can see his blackened bones, I can sleep at night." His wife pleads with him that nothing can bring back their murdered daughter: "Oh Hans, he must be dead. And dead or alive, nothing can bring our little Maria back to us." When Hans walks over the unstable beams from the wreckage of the fire, he falls through the collapsed floor and splashes into an underground millpond/cistern below. With emphasis from the musical score for a dramatic entrance, the creature's hand and arm first appear from behind a wooden beam, and then the Monster steps fully into view from the shadows - with grotesque electrodes at the neck and a flat, square head (and a face scarred by the fire). Hans is held under the waist-deep water and drowned by the Monster. A sleepy-looking owl witnesses the murder. In one of the many scenes displaying macabre humor, Han's wife reaches into the wreckage for her husband's extended hand, not realizing that she is pulling the Monster from the debris. The resurrected Monster kills the silly farm wife by heaving her down into the mill (again watched by the owl), and stalks off into the countryside. Soon, he comes up behind Minnie who turns, sees him and becomes panicked, hysterical and crazed at the sight of the Monster. Screeching, she turns and runs off in fright, leaving the bewildered Monster standing there. Nobody will believe me. What? I'll wash my hands of it. Let them all be murdered in the beds. Elizabeth: No, no! It's the Devil that prompts you. It's death, not life, that is in it all and at the end of it all. Elizabeth: Listen Henry, while you've been lying here, tossing in your delirium, I couldn't sleep. And when you rave of your insane desire to create living men from the dust of the dead, a strange apparition has seemed to appear in the room. It comes, a figure like Death, and each time it comes more clearly - nearer. It seems to be reaching out for you, as if it would take you away from me. There it is. Look! (pointing into the room)There!